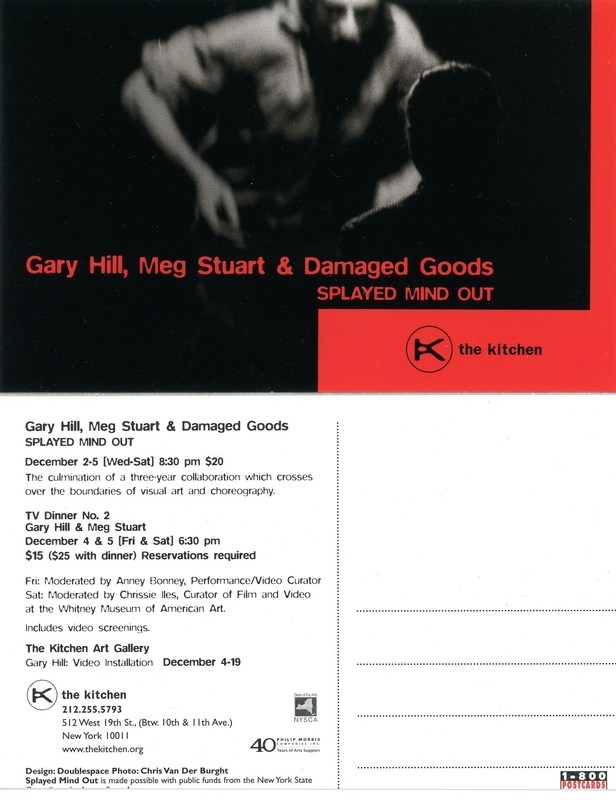 A collaboration between video artist Gary Hill and choreographer Meg Stuart, their piece “Splayed Mind Out” combined performance, video, and spoken text. Four dancers enacted what the artists called a “visual sculptural pose,” foregrounding the body’s materiality. This emphasis on embodiment dovetails with the poetic text, resulting in “a radical dissociation between body and mind.” The piece was accompanied by two evenings of dinner and discussion with Gary Hill and Meg Stuart, the first moderated by Anney Bonney and the second by Chrissie Iles.